Frontal facial balance is achieved by the symmetry and proportion of the nose and chin. If your chin is small, or large in dimension, or disproportionate, this can have a big impact on your overall facial appearance, and leave you feeling self-conscious. At Wentworth Clinic we have many years’ experience in providing our female patients with transforming chin implant surgery procedures to correct and enhance the overall shape of the face. 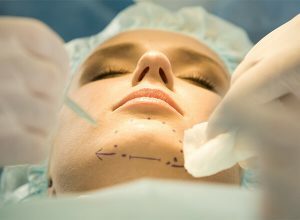 Genioplasty: the surgical correction of the chin, known as ‘sliding genioplasty’, and a modified technique called, ‘box genioplasty’. Chin implants or Chin augmentation, in which a silicone-based implant is used to achieve the desired chin shape and a more balanced and pleasing facial appearance. Our chin surgery patients often combine their treatment with other aesthetic procedures, such as a cosmetic facelift, jaw surgery, or rhinoplasty, in order to obtain the most desired outcome. At your one-on-one consultation, our plastic surgeon will examine your facial profile, ascertain which procedure is the correct one for your particular requirements, providing you with your desired final look, i.e. a well-balanced, and evenly proportioned face. During your consultation you will be fully informed about your Genioplasty or chin implant procedure, being advised of the benefits, and any complications that could occur. Only then will we schedule your chin correction surgery. So, when you are ready to take that next step, or if you wish to find out more about our chin implants procedures, and chin correction surgery for women, contact Wentworth Clinic via our contact form, or call us on 01202 422171. Our clinics are located in London and Bournemouth and cover South East England including Kent, Sussex, Hampshire, and Dorset etc where we perform full maxillofacial and cosmetic surgery treatments including facelift surgery at our state of the art clinics. You will find more detailed information about the Genioplasty and Chin Augmentation procedures below. The excess bone is removed and the segments are stabilised by a very small titanium plate and screws. The segment is augmented to the desired position and stabilised with a titanium plate and screws. If the gap is up to 5mm there is no need for interpositional grafting. If the defect is larger than 5mm then your surgeon will describe the possible surgical options to you. An incision is made inside the mouth. Two sensory nerves that give sensation to the lips (mental nerves) are exposed and retracted (pulled back). The bone is cut along the symphysis and parasymphysis (the chin) and the segment is mobilised into the desired position. Once the segment has been stablished with the titanium plate and screws, the oral mucosa (the mucous membrane lining of the mouth) is closed in layers. Sliding Genioplasty is performed under general anaesthetic. However, a known complication of the procedure is the possibility of nerve trauma resulting in partial numbness of the lip. In order to avoid these complications, Wentworth Clinic has developed a modified chin surgery technique. After many years of performing genioplasty surgery, Mr Ilankovan has perfected a more simplified chin correction procedure, known as ‘box genioplasty’. Performed under a local anaesthetic with oral sedation, only the symphysis of the lower jaw is cut. To date, we have had zero incidences of nerve damage using the procedure. A cut inside the mouth. A cut into the skin, just below the chin. A pocket is created in which the silicone-based implant is placed and positioned to achieve the desired height and shape. Rest quietly in bed for the first 24 hours with your head raised. Your chin/cheek will generally be firmly taped following surgery. Put an ice pack on the chin for the first 4 hours. Minimal talking or laughing in the first 48 hours during which time a liquid diet is best/easiest for you. Eat soft food during the first week. Use of a toothbrush may be difficult for some days but you must try your best. Use mouthwash (warm salty water) regularly. Pain and discomfort experienced will vary from patient to patient. Your Surgeon will instruct you on pain relief. Take antibiotics prescribed by your Surgeon. No Aspirin or products containing Aspirin and no Vitamin E for one week. For your safety, do not drive whilst taking painkillers. When bending down, bend at the knees, not with your head down. Expect to have swelling for 2 – 3 weeks and stiffness/rigidity of the chin for approximately 1 – 2 months. Avoid excessive movement of the mouth and neck. No heavy exercising for 3 weeks. In some cases there is temporary numbness of the chin/cheek due to stretching of the nerve supply. Stitches are dissolvable, but if they do bother you they can be removed after 10 days. Gargle your mouth with warm salty water 3 times a day. Do not pull the lip down to inspect the sutures. Moderate discomfort, take pain killers as advised. Moderate swelling and bruising, sometimes more on the second or third day. Severe pain not responding to medication. If you require further advise or have any other concerns please call us on 01202 428773 or 01202 422171 (during office hours). Our Genioplasty and Chin Implant procedures at Wentworth Clinic start at £4000. Find out more about the type of procedure you require by completing our ‘book a consultation’ form, or call our London Harley Street Clinic, or Bournemouth Clinic to speak with one of our team.